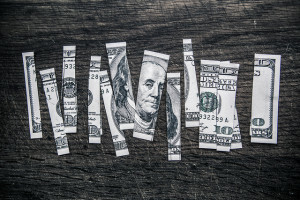 Is Google Poaching Money From Your Small Business? If you’re not careful, Google could be poaching money from your small business. How though? If you are running Adwords Express ads, you better read on as this post could save you hundreds of dollars. Lately I’ve had a few phone calls from potential clients inquring about our Adwords management. They say they’re currently running campaigns but not seeing much in the way of results but receiving big invoices. My first question is always “Are you running regular Adwords ads or Adwords Express (ADEX) ads?”. The answer is always ADEX. I give a small sigh and explain my issues with Adwords express. Google is well aware small business owners are very busy. Therefore they created ADEX to make it really easy for anyone to setup. And many small business owners, perhaps even yourself, took the bait. ADEX is a huge money maker for Google and it preys on busy business owners with markting dollars to spend. So if you’re running ADEX ads or are thinking of, DON’T!!!!! After two minutes looking into a clients ADEX account last year, I soon relized it was way too limited. In regular Adwords you can set your bid amounts per keyword, choose what keywowrds you want and don’t want to target, choose a large or very small geograpical area to display your ads in and track the analytics of each keyword. All the above are important. You don’t get these options in ADEX however. Of all the limited abilities of ADEX and my biggest issue is one that could be costing small business owners money and has Google poaching money from small businesses. Through my endless hours of sifting through client analytics, a vast majority of organic clicks are branded search terms. This got me thinking, what do the search results look like when I search for a brand? 99% of the time the proper brand and business own the top organic result and even have their GMB page snippet on the right. Here’s what the search results look like. So we see two ads, theirs and a competitor. Now I understand how you could want to create ads that target competitor search terms. But if someone is searching for a brand, chances are they are looking for contact info and have already made their purchase decision up. Now the above ad may not be an ADEX ad but a regular Adwords ad. And I’m not calling Lasik MD or whoever magaes their PPC out. But it’s an example of how if you’re not careful in both platforms, you can waste a lot of money. 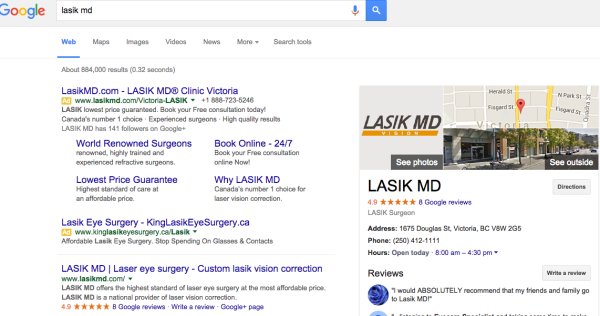 In the above example I can guess Lasik MD is paying upwards of $6 + per click here. I don’t understand why because their GMB page snippet is on the right and their website is the first ogranic result. People will click on that ad even though the website is organically listed below. So in a lot of ways, Google is poaching money from Lasik MD by stealing clicks on their organic listing by having an ad at the top. Again this could be because Lasik MD want their ad there. But if they don’t, it’s wasted money. Imagine if they had 200 branded search terms perfomed a month and 15% of those people clicked on their ad at $6. That’s 30 clicks for $180. Over the course of a year that adds up. And the branded search term is one example of the ADEX lack of ability to choose what search terms you target. Another example is people who could be looking for jobs or careers at your business. Or people searching for a paint store when you are a painting contractor. 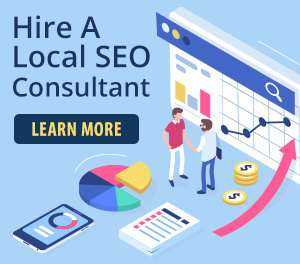 After having looked through lots of PPC accounts, I’ve had my fair share of moments where I say “Why did this person search that term and click on that ad which is not even remotely close to what they are looking for! ?” Regardless these clicks cost business owners money and only makes Google more money. Are you that business owner? If so, it’s time we talk. Don’t watse money if you don’t have to and think deepely about signing up for Adwords Express.